Adirondack Lifestyle ™: Happy Telemark Tuesday! I am pleased to report the snow express is back on track in the Adirondacks! Mother Nature blessed us with 8 inches of fluffy fresh powder last night and today. Skiing at Mount Van Hoevenberg was wonderful today! Ski-skating was the technique of choice as the trails benefited enormously from the slushy snow and rain we had two days ago, followed by the current bitter cold and snow. 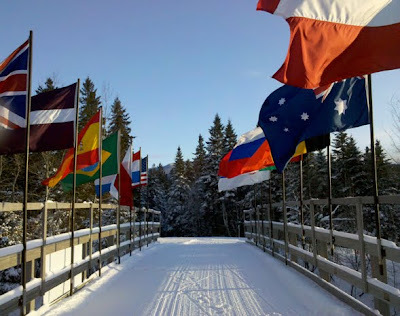 As you can see in today's featured photo of today's ski, life is good in the Adirondacks! Looks great! Where are you skiing this weekend? I'll be in the Adirondacks! Happy Telemark Tuesday from Snowy Lake Placid!